The most remarkable thing about Jana Hoeffner’s 2,360 mile road trip from Stuttgart to Oslo and back, in a black Tesla Model S sedan, was simply how unremarkable it was. Five years ago, making similar journeys across much of Germany in an electric Renault Zoe would have meant tiresome research to avoid running out of power, she says. These days, not so much. Or even at all. “It doesn’t really involve much planning anymore,” she says. Hoeffner, 38, who’s an online editor, is emblematic of a quiet revolution finally taking hold in Europe’s biggest car market. Conventional wisdom held that Germans, proudly sitting at the source of global automotive engineering prowess, would be among the last to trade in their Porsche 911s or Mercedes-Benz S-Class diesels for the limited autobahn range offered in an American-made electric Tesla. 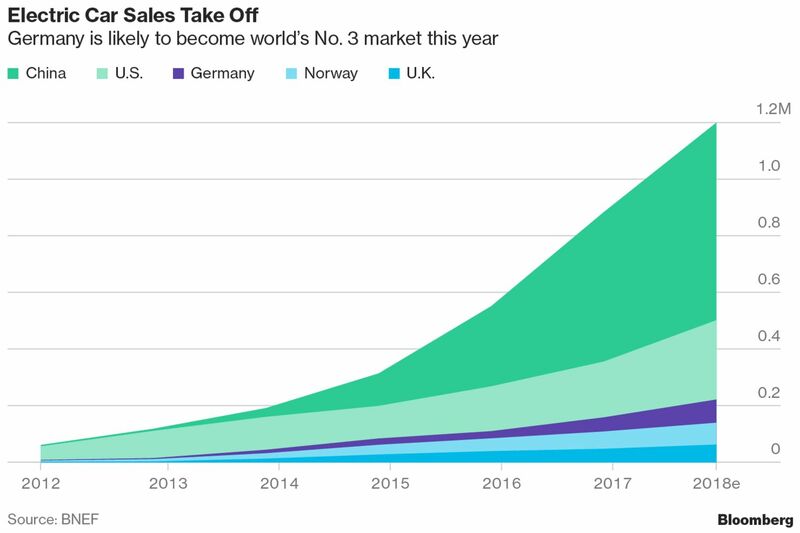 But powered by additional charging sites and improving products, Germany this year will become the world’s third-largest market for plug-in hybrids and electric cars, surpassing longtime European leader Norway, according to Bloomberg New Energy Finance. The downfall of diesel following Volkswagen's widespread cheating on emissions and a mounting public backlash against urban pollution are only adding momentum to the shift. Underpinning it all is a charging network that’s growing quickly to become five times more dense than what’s offered on American roadways. The number of outlets soared by a third last year to 8,515, according to Statista. While that may not sound like many, on average that’s one every for every 16 square miles. 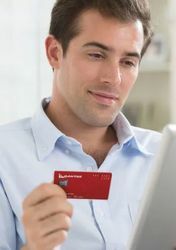 A particular pet peeve for her is the fistful of customer cards needed to get juice from Germany’s disjointed infrastructure. “It should be just as easy as paying for your fuel at a gas station,” she says. Even carmakers– who for years argued they built cars, not infrastructure – are chipping in as part of their €40 billion (A$62.8 billion) splurge on electric technology budgeted for the next few years. Longtime rivals VW, BMW, Ford and Mercedes-Benz parent Daimler have come together and started construction of a fast-charging network along Europe’s highways. The unprecedented alliance plans 100 stations by the end of this year before quadrupling the total by the end of the decade. The government has stepped up measures too, after disappointing sales forced Chancellor Angela Merkel to backtrack from an earlier target of putting one million electric vehicles on German roads by 2020. Since 2016, buyers of electric cars get a €4,000 rebate, while owners of plug-ins hybrids get a €3,000 subsidy. 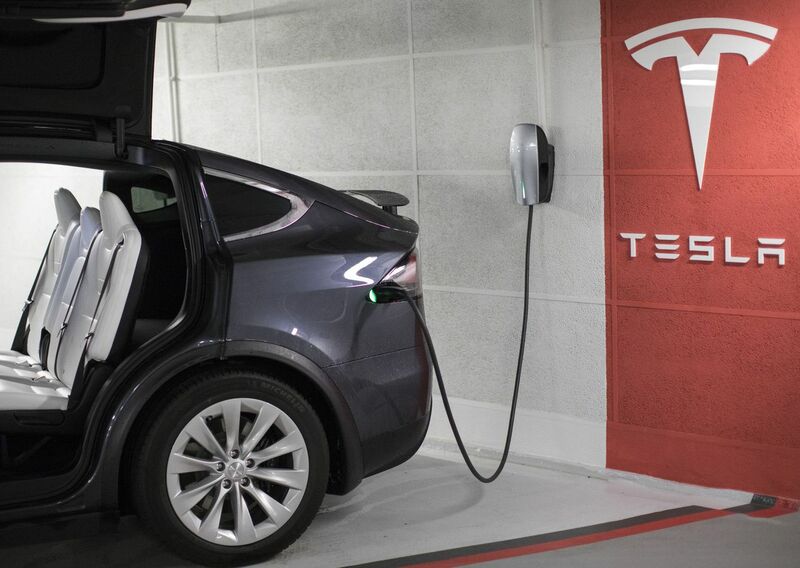 There’s also a €300 million budget to boost the build-out of charging infrastructure. Merkel, zeroing in on forming a government after last year's election, is planning even more measures, including tax incentives. So the market is responding. Sales of plug-in hybrid and electric cars are set to jump 64 percent this year to 82,000 vehicles, BNEF forecasts, making Germany the fastest-growing region among the top five markets. BNEF says that forecast may be conservative, and deliveries could easily double again this year. 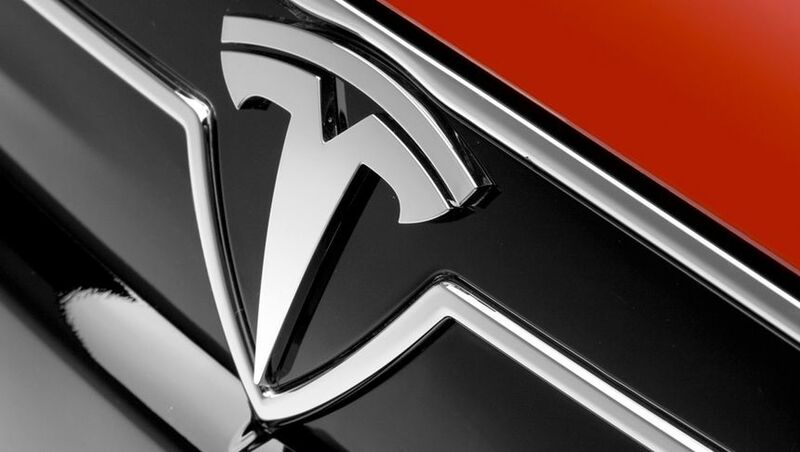 Tesla is growing even more quickly in Germany than electric-car sales generally. Registrations gained 75 percent last year to 3,332 vehicles. That’s approaching the 3,900 sales of the Porsche Panamera four-door, a close competitor to Tesla’s Model S.
Even after big gains, battery vehicles remain a tiny fraction of last year’s German sales of more than 3.4 million new cars. But new models rapidly rolling out across showrooms nationwide could end electrics’ bit-player status soon. Electric vehicles hitting showrooms this year include Jaguar’s I-Pace crossover sport utility vehicle, as well as Audi’s Q6 e-tron SUV. BMW is unveiling a battery-powered Mini next year, alongside Mercedes-Benz’s SUV as part of its EQ brand. Diesel-stained Volkswagen will launch the fully-electric I.D. Crozz compact crossover and the I.D. Neo hatchback in 2020. For now, plenty of – sometimes petty – struggles remain. Parking offenders, safe in the knowledge of lax enforcement, block inner-city charging spots, Hoeffner says. And Germany has work to do, too, to improve patchy coverage. Saxony-Anhalt, one of the states of former East Germany, counts just 55 stations, compared to some 870 in Bavaria, according to the Federal Grid Agency. For the foreseeable future, perhaps the biggest drag on electric car sales is, actually, drag. 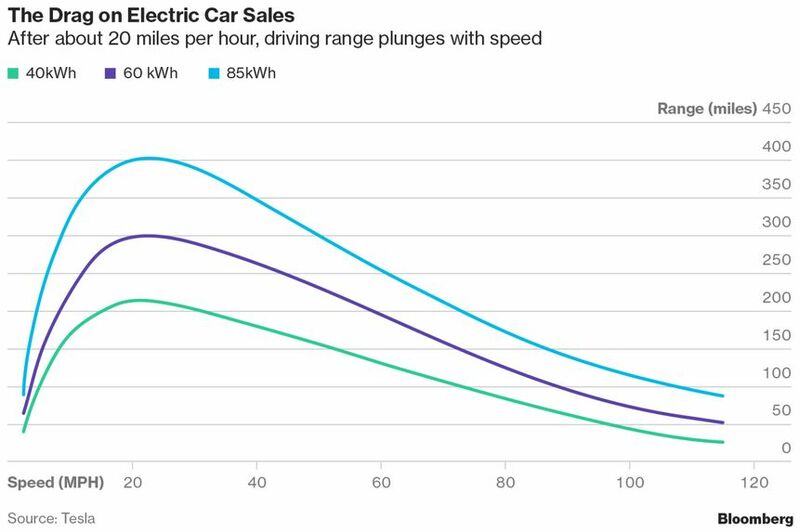 Because the driving range plunges as speed increases, electric cars will struggle to keep the pace for long with a 911 on the famed autobahn, where some-two thirds of the roads have no speed limits. If LCT gets cancelled in Australia, Tesla sales would double or even triple. So on the autobahn where you typically sit above 100mph you get less than 100 miles range? That's less than an hour driving time and that assumes a full charge and not a quick charge to 80% or whatever. Interesting in Norway to see small towns that in other countries would probably have a Ford or Toyota dealership, they have a Tesla dealer. Yeah the LCT is a kicker, until now I never cared about it as I am not a car guy. Now I am in the market for a car and had my on on a Tesla, however the LCT just push's it out of the affordable range. If the LCT was removed I'd already have one in the drive way. Comment on "Teslas are replacing Porsches on Germany's autobahns"